Welcome to the new look Inside Crochet. A lot has changed since I last saw you, not least the little tornado that has torn through my life in the shape of my baby daughter, Millicent. Now, after what could not exactly be described as a break, it’s exciting to be back, especially with a redesign to oversee and a talented new team to work with.Over the coming months, we shall be adding to and improving the magazine, so there will be some more lovely new additions to look forward to. photographed by the talented Britt Spring, showcases some fabulous pieces inspired by travel and the sea. These include a beautiful cardigan reminiscent of fishnets (designed by Vicki Brown) which makes a feature of her cute handmade buttons. This issue also features one of my own patterns, Syd Rabbit, from a crochet classic called Susan Cropper’s Vintage Crochet. This is one of my favourite designs, so I hope you will like him too. Talking of old favourites, we still have many of our familiar features such as reviews, interviews, news and interesting articles, all packaged up in a pretty new style. 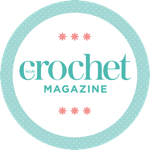 We hope you enjoy this new look Inside Crochet.